Gardening, I often think, is the never-ending story. Why? Because gardeners rarely focuses on the here-and-now. Instead we think of next week, next month, next year. Perennials to divide, seeds to sow, weeds to pull . . . . Someone visits, admires the garden, and the response is generally something along the lines of "Oh, if only you had been here last week / next week when thus-and-such was /will be in bloom." Here and now, people, let's look at today. Well, not exactly. I frequently visit my friends Bea and Jerry. The visits always incorporate a tour of the garden. Here, then, is a compilation of my August visits. Understand, it is a remarkable garden in many ways. There's a greenhouse spacious enough for a botanical garden, filled with a world-class collection of cacti and succulents. 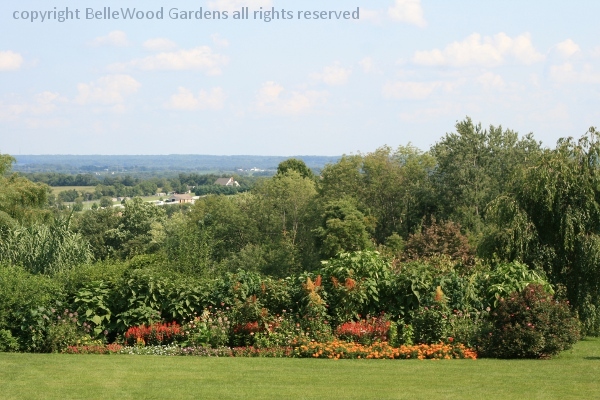 Across the sweep of lawn is a summer border filled with annuals raised from seed and backed with angel trumpet, Brugmansia, massive enough that a small chainsaw is used to trim them back for winter storage in the head house. And bucolic borrowed scenery. Visions of paradise. The swimming pool has more than one purpose as a luxurious place to swim. In summer it also serves as a display area for outsize, elegant, succulents in huge pots to enjoy a summer vacation out of doors. As well, several tubs of fig trees and a decorative banana add to the tropical ambience. There are other bananas here and there, some in tubs and a jungle's worth in the ground. Musa basjoo, the Japanese fiber banana is hardy enough to survive in New Jersey with a modicum of winter protection. 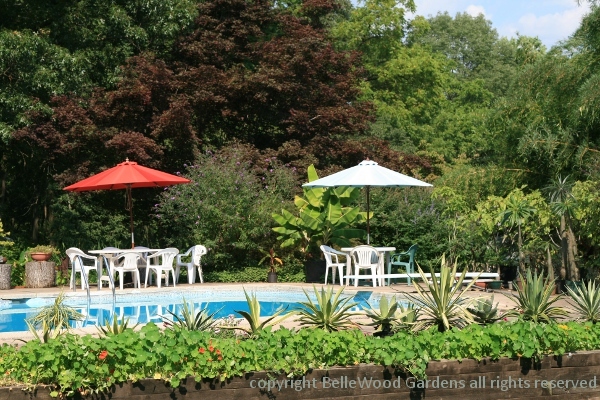 Uncovered along about tomato-planting time, fertilized and well watered, the numerous culms would look well in Florida. This year, with all the rain and a good stretch of hot weather they have outdone themselves, sky-rocketing up about 20 feet tall, flowering and fruiting. 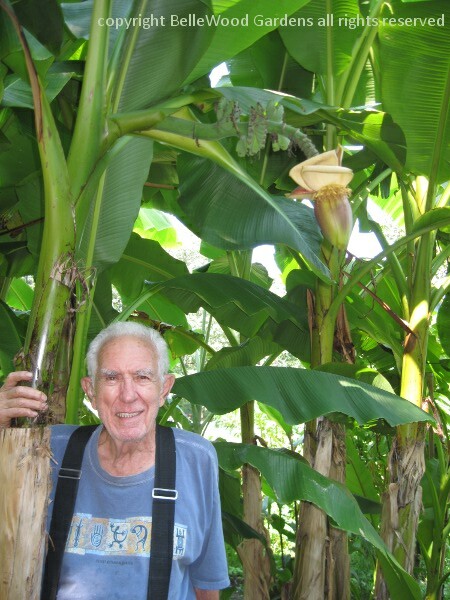 Not especially edible but the mere idea of cropping bananas in the Garden State is certainly enough to bring a smile to Jerry's face. 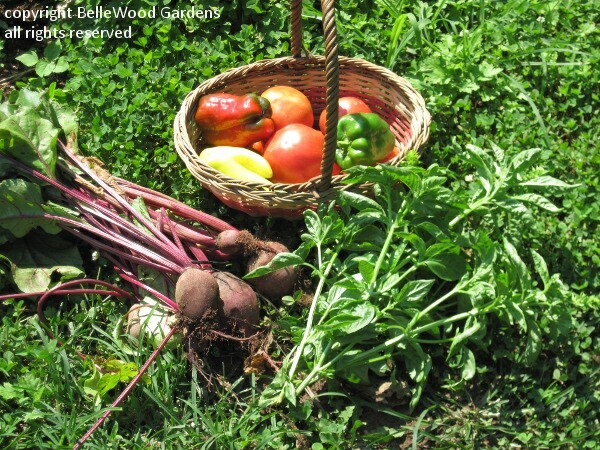 A summer visit often sees me sent home with a basket of vegetables from the spacious vegetable garden. Today it is tomatoes, peppers, beets, and basil. Freshly harvested, superb eating. 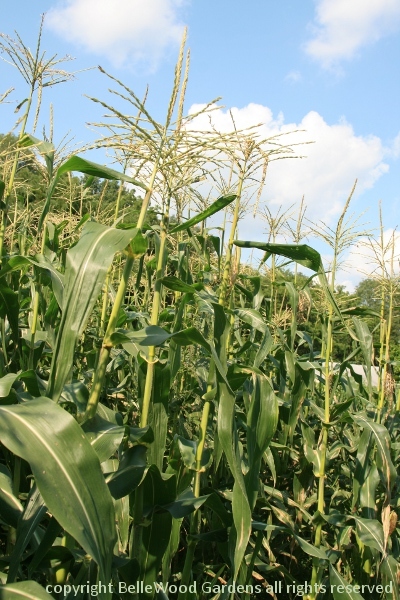 There's a fine stand of corn this year. I'm not sure but what Jerry should have a machete with him, to hack his way back out. Another week, another visit, and the corn is still producing. 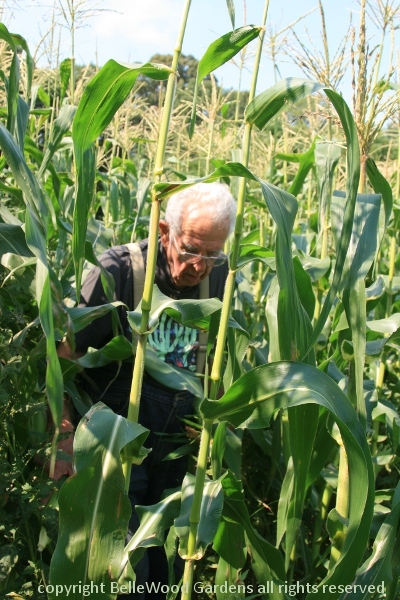 In fact, for a family gathering Jerry was able to pick 3 dozen ears. 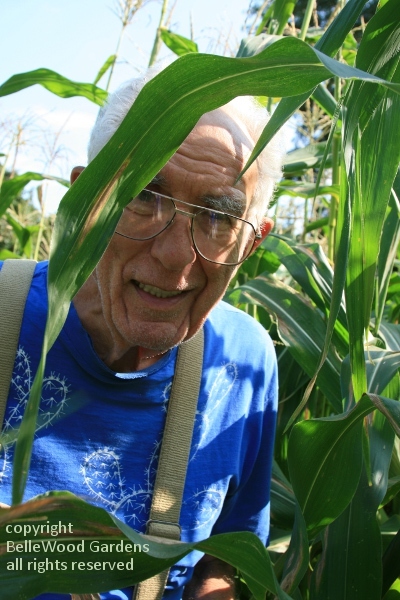 There are 90 ears of corn on the cob in the freezer, kernels from an additional 90 ears cut from the cob, packaged and frozen, and he still has corn to share with me. No wonder he's smiling so much. So am I.
especially when it comes to the vegetable garden. 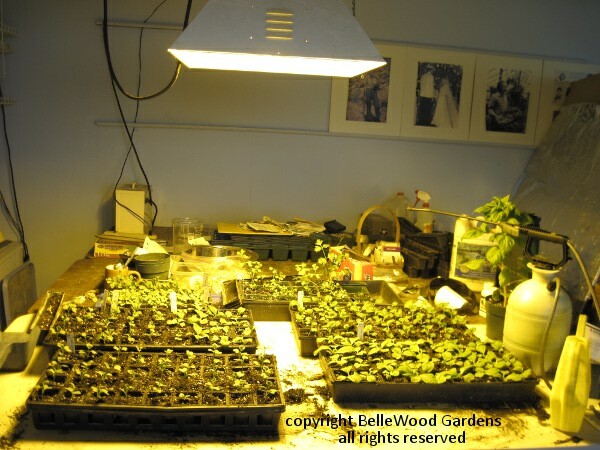 He's already started seeds for cold tolerant vegetables for autumn (and even winter) harvesting. Indoors he has an HID (high intensity discharge) lighting unit. 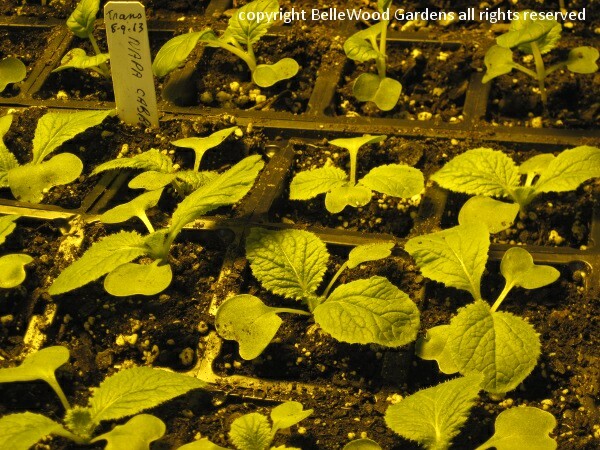 It really kick starts seedling growth. Tray of recently germinated seedlings soon to be transplanted to cell packs. This image was taken on 12 August. 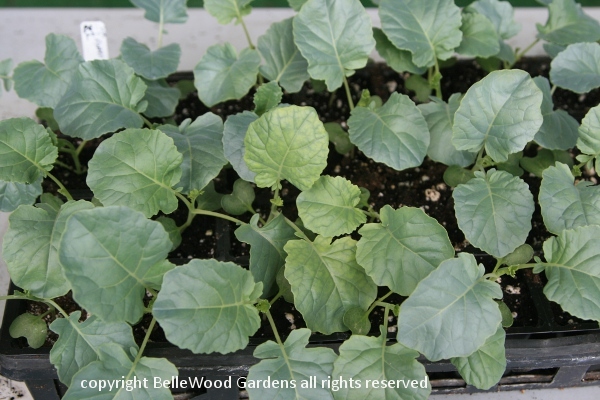 These seedling napa cabbage plants have grown from seed sown on 9 August. 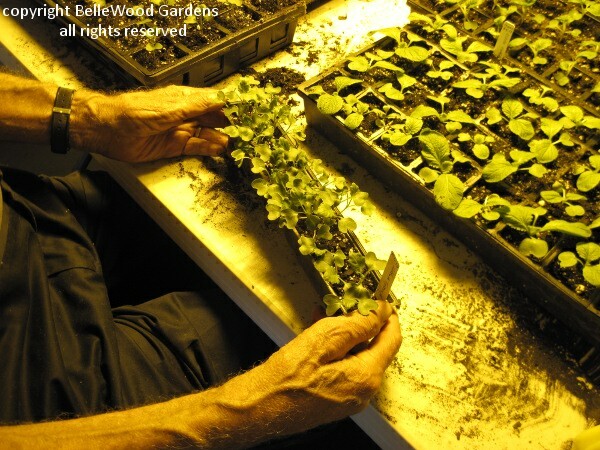 There's an intermediate step before the seedlings are transplanted into the garden. They'll spend a few days outdoors, still in the cell packs, acclimating to sunshine and breezes. 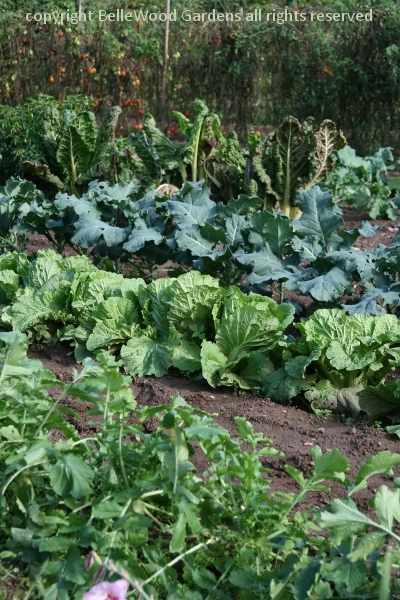 Broccoli, pac choi, napa cabbage, kohlrabi, daikon radish - the garden will provide a harvest well into winter. That, however, is looking ahead, something I claim that forethoughtful gardeners are wont to do. Meanwhile, here it is the 29th of August. 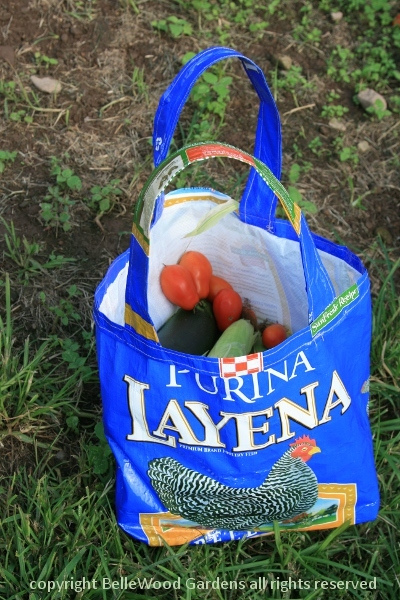 And my feed bag tote is heavy laden with corn and zucchini, tomatoes and beans. How fortunate am I to have such good friends as Bea and Jerry, with whom to walk down the garden path. Those little seedlings from early August? Just look at them now! Daikon radish in the foreground, napa cabbage, broccoli, and Swiss chard. 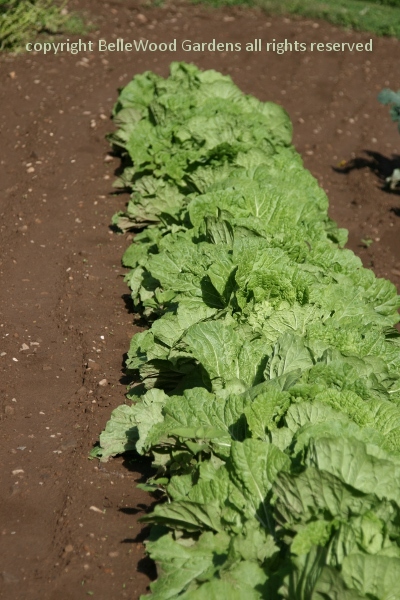 Napa cabbage, crisp and just about ready to harvest. Take every other one, so the rest have room to grow even larger. 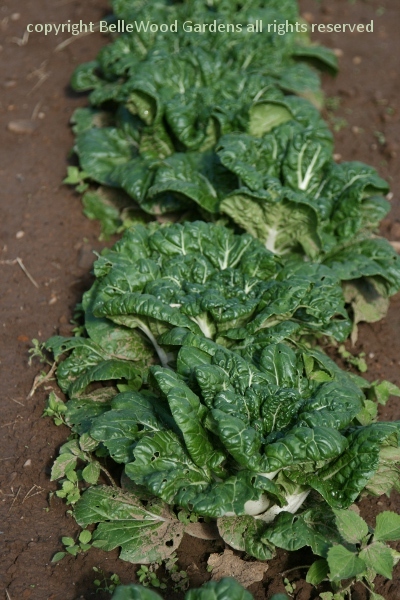 And don't forget the bok choi, crisp dark green leaves arrayed on crunchy white midribs, excellent for stirfried dishes. 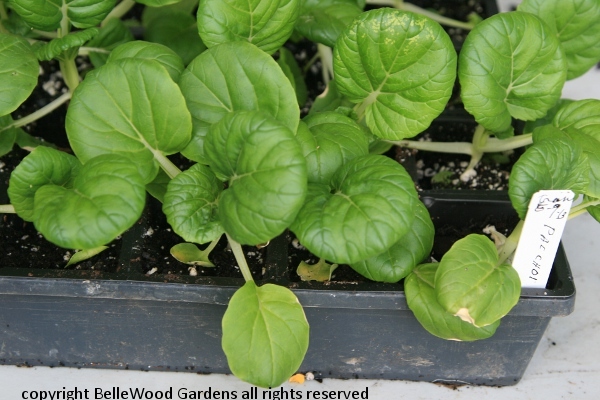 Frost will not harm these late season vegetables. The careful planning means this thoughtful gardener will be able to continue the harvest as the year swings down to a close.